A properly designed and installed water garden at your Altoona home can give you an all-natural, low maintenance piece of paradise, as well as, provide food, shelter, and safety to the wildlife around it. 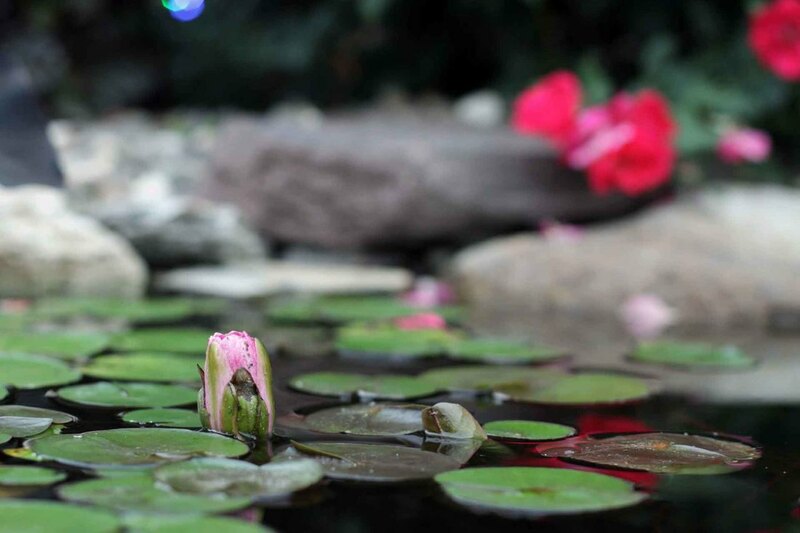 The key to a beautiful pond comes in the proper inclusion and placement of each piece of the water garden ecosystem puzzle; Circulation, Filtration, Fish, Aquatic Plants, Rocks/Gravel and Bacteria. Scroll down to the section below to read the details on the Aquascape Ecosystem. Our true artistry comes out in our water gardens. 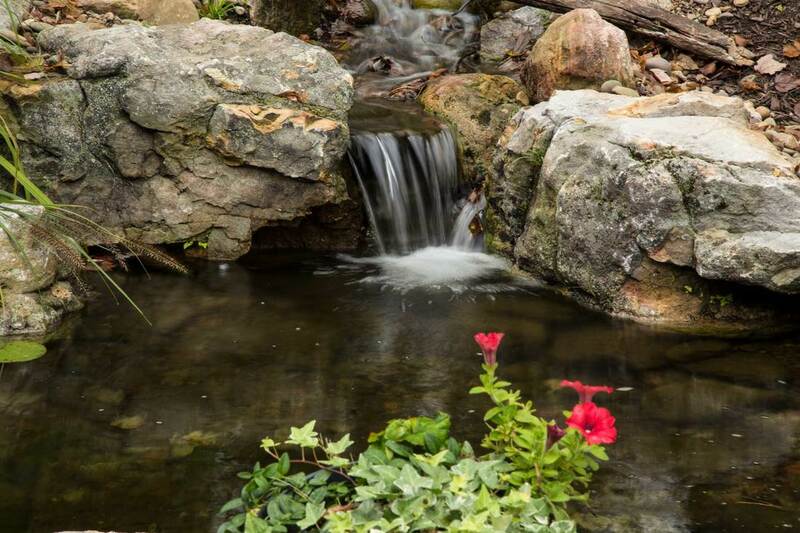 We love building ponds and waterfalls as much as you enjoy listening to the peaceful rippling water while you have dinner on the back patio at your Altoona home. It's truly relaxing watching the fish swim around and chase each other for hours on end. It's refreshing to walk out in the morning and see a new lily flower blooming in your pond. Unfortunately, water gardens are the easiest thing to make mistakes on when building your backyard paradise. It is sad to see people make a significant investment and have a pond put in and be frustrated because it does not work as intended. Before hiring a Altoona pond contractor to build your water feature, we highly recommend requesting to see completed jobs and talking to past clients of whoever you are considering hiring. Not all water features are created equal. Allow Tussey Landscaping to walk you through the ins and outs of a properly designed waterfeature. We have literally hundreds of happy pond customers. The water gardening lifestyle really can be maintenance free and enjoyable. 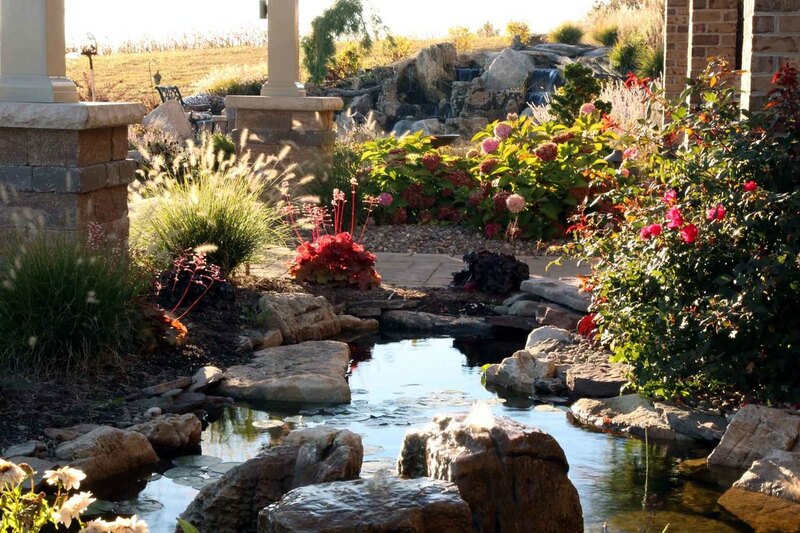 We invite you to see many of our ponds and waterfalls built in our display locations across Central Pa in State College, Altoona, Bedford, and Hollidaysburg Pa.
We offer Water Garden Pond Design & Installation services for Altoona homeowners. 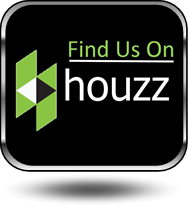 We install Ponds, Pondless Waterfalls, Bubbling Rocks, and various Fountains. Many different ways of building water gardens have been tried and tested throughout the last decades. Over the last 25 years, one method has emerged, rising head and shoulders above the rest as the most sustainable, consistent, and easy to maintain solution by far. It is the Aquascape Ecosystem. ​Circulation System is really just a fancy way of saying “pumps and plumbing.” The proper size pump and pipe diameter are extremely important for the aesthetics of a water feature. More importantly, an efficient circulation system keeps the water moving and provides the necessary oxygen levels for healthy fish and plants. 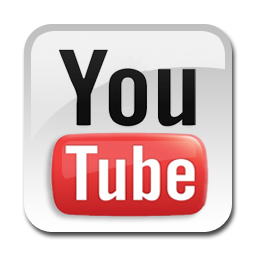 Proper Filtration System includes the use of both a biological and a mechanical filter. A biological filter provides surface area for beneficial bacteria to colonize and remove excess nutrients from the water. A mechanical filter will not only pre-filter the water and house the pump; it will also skim debris from the water’s surface to prevent the accumulation of organic materials on the pond floor. Fish are an integral part of any ecosystem. Unfortunately, fish are often seen as creating a maintenance nightmare. Contrary to popular belief, fish will actually reduce pond maintenance, as they graze on string algae and bottom feed from the pond floor. Aquatic Plants are Mother Nature’s true filters. Plants are great for adding character to a pond by providing color and texture, but from a filtration perspective, they’re second to none. 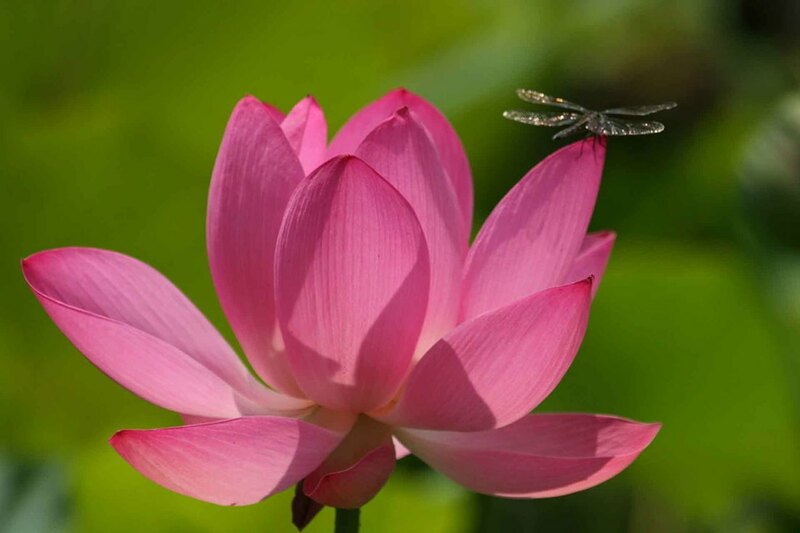 Thriving from the excess nutrients in a pond and depriving algae of its food source, the aquatic plants in a water garden, given proper coverage, are critical for the overall health of the ecosystem. 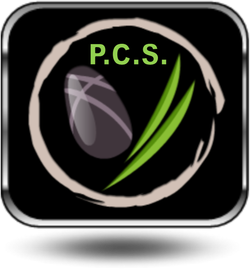 ​Rocks, Gravel, and Bacteria have been a controversial element in the hobby for many years. Many enthusiasts have steered away from rocks and gravel out of fear that their system will become a maintenance nightmare. 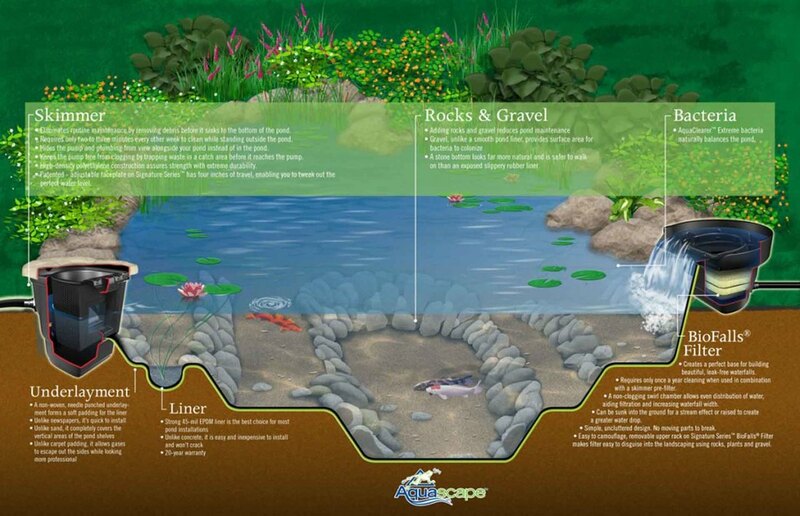 On the contrary, rocks and gravel will not only make your pond look more natural, they will also protect pond liners from UV light degradation and they provide tremendous surface area for beneficial bacteria to break down excess nutrients in the water and dissolved organic debris on the pond floor. Having all these things in place makes all the difference in the health and success of your water garden. Use them and work with Mother Nature, not against her, for a chemical-free wonderland of water! The truth is that most people opt for the ecosystem way of water gardening because it’s easier and it just makes sense. A low-maintenance ecosystem pond provides you with more free time to enjoy friends and family … while gathered around your pond, of course!